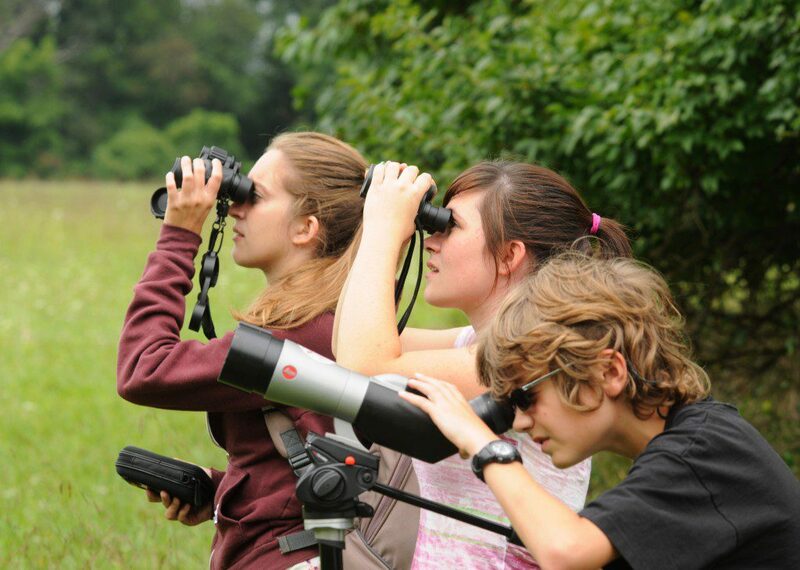 Eager summer campers scan the skies at Middle Run Natural Area, overseen by camp instructor Sarah Stapley (center), a former Delaware Nature Society intern and Tri-State Bird Rescue volunteer. The 2014 Delaware Nature Society summer camp season kicked off last week with great weather and excellent opportunities for youngsters to get outside at locations that DNS owns, operates, and/or manages around the region. For the sixth straight year, a unique camp based in the Newark area offered hands-on experiences with conservation projects, volunteer service, citizen science, and nature observation. 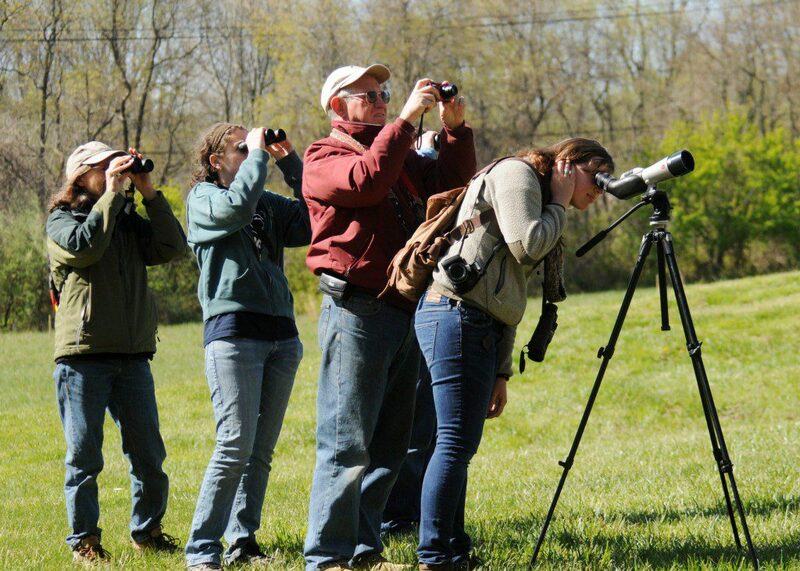 The Bird Experience at Middle Run is based at the 860-acre Middle Run Natural Area, and is made possible by a partnership between DNS, Tri-State Bird Rescue and Research, and New Castle County Parks. Each day the campers spent time volunteering at Tri-State’s center to build nest cups for baby birds, clean bird cages, and prepare platters of food for adult birds. A bird veterinarian showed the students the anatomy of different birds during a dissection session, and oil spill response experts trained the students in proper care of oiled birds. Campers proudly display their decorated bird boxes in front of Tri-State Bird Rescue and Research, where they donated their time as volunteers to help orphaned and injured birds. The campers each built and painted a nest box for birds that will attract House Wrens, Eastern Bluebirds, Tree Swallows, or other cavity-nesting songbirds to their home landscape. They created “suet logs” out of large dead branches, and will pack the holes full of suet to attract woodpeckers to their backyards. And every day they walked the one-mile Middle Run Birding Trail and observed great birds like Bald Eagle, Louisiana Waterthrush, Orchard Oriole, Barred Owl, and Scarlet Tanager. 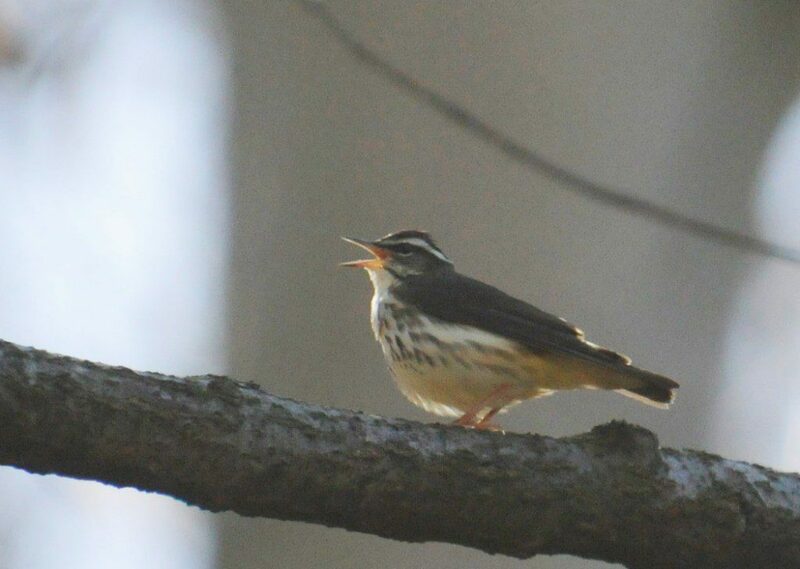 The students entered all of their sightings into the E-bird database of citizen science bird observations, and their efforts helped notch the milestone of Checklist #1,000 submitted for Middle Run Natural Area! A female Tree Swallow, clutched gently in researcher Ian Stewart’s hand, shows a leg band that indicates that she was banded last summer (2013) by Ian on the Delaware Nature Society’s Coverdale Farm Preserve, 7 miles to the north of Middle Run Natural Area. The Friday Finale for the camp meant a visit from University of Delaware researcher Ian Stewart, who is conducting a multi-year study of nesting Tree Swallows and Eastern Bluebirds at DNS’s Coverdale Farm Preserve. Ian demonstrated his bird banding technique on a male Tree Swallow he captured at an active nest box near the camp location. Upon releasing the male back at the nest site, he checked inside the box and found the female sitting on the pair’s four nestlings. And then the big surprise came: the female was already banded! And she wore one of Ian’s bands that he recognized. We immediately guessed that the female was one banded at Middle Run last year when Ian visited the same summer camp. But then came the unique twist: by checking his records, Ian discovered that she was actually banded last summer at Coverdale Farm! That little aluminum band tells us that the swallow grew up at Coverdale last June 9th, learned to fly and feed that summer, likely flew all the way to Central America for the winter, and then returned north to nest this Spring, settling in and raising young just 7 miles short of where she was born last year! 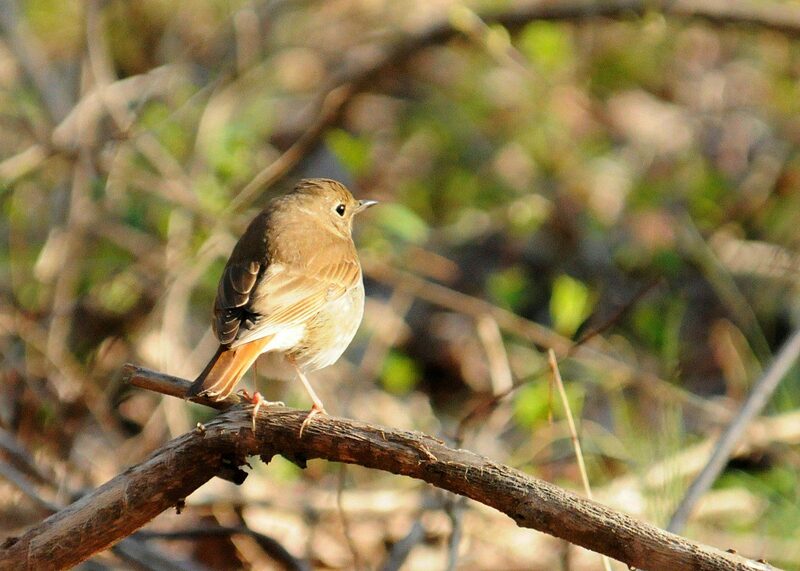 This type of information that is able to be gathered by scientists points to the real power of bird banding efforts. Less than 5% of all banded birds are ever recovered, but a recapture like this one adds to the treasure trove of data that bird researchers rely on to further unravel the mysteries of the birds. 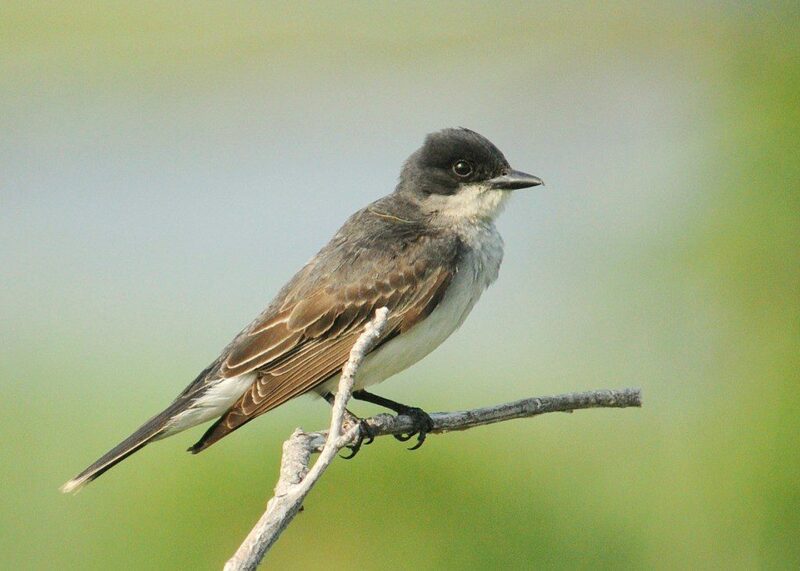 Tree Swallows are a common bird, and yet this unique discovery adds another layer of knowledge to our understanding of this species. And sometimes luck plays a big role in the discovery of banded birds! The video of highlights from the week of camp shows the many ways that the campers interacted with wildlife and made a difference for bird conservation. Enjoy watching! A male Prairie Warbler sings from his perch in an Autumn Olive near Trail Marker 5 on the Middle Run Birding Trail. Image by Derek Stoner, April 28, 2012. With April almost finished and May on the way, the activity level of birds is really picking up. 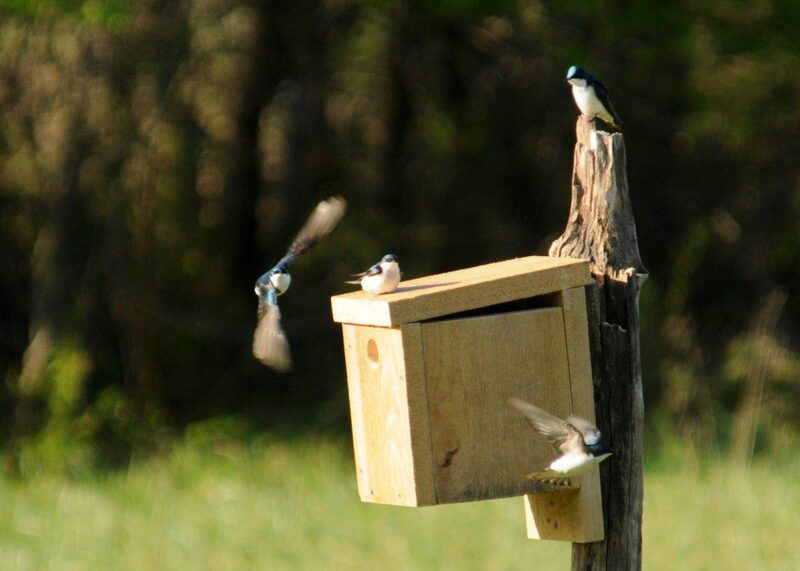 Many birds are already nesting, and a visit to the Middle Run Birding Trail this morning showed Tree Swallows gathering nesting material, Carolina Chickadees on seven eggs, and Eastern Bluebirds feeding three fledglings. 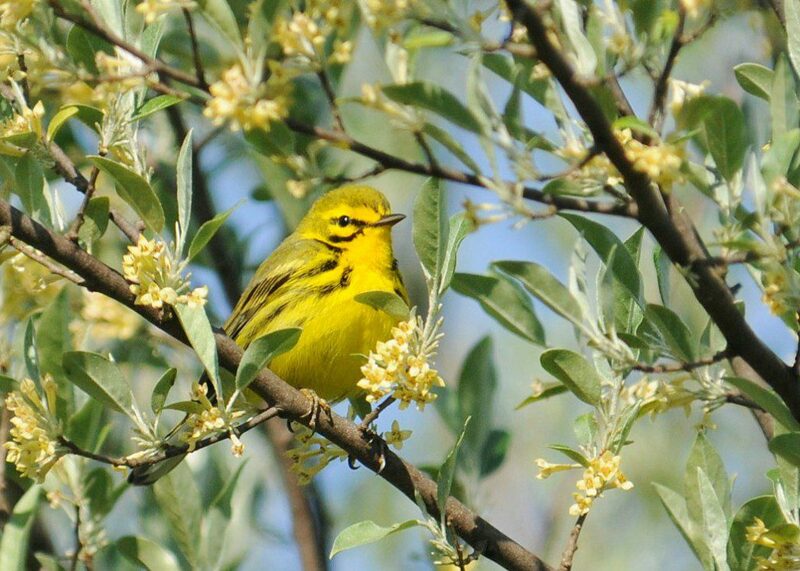 Recently-arrived neo-tropical migrants like Prairie Warblers are on territory and singing, trying to attract a mate for the nesting season. The “Meadow Mosaic” area on the Middle Run Birding Trail between Markers #4 and 6 had three different male Prairie Warblers singing. A male Blue-headed Vireo shows himself briefly as he goes about the business of finding food. Image by Derek Stoner, April 28, 2012. Other birds are passing through the area on their way to nesting grounds further north. The Blue-headed Vireo is a bird that breeds primarily in the Boreal Forest of Canada, and stops by Delaware on its north-ward migration. 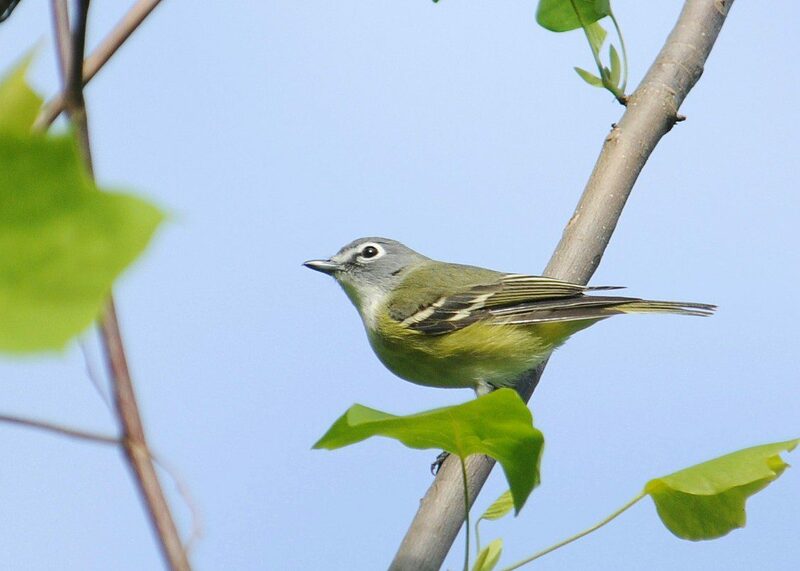 Vireos and all other species of migrant songbirds depend upon an abundance of insects (primarily caterpillars and flies) that are found on native plants. 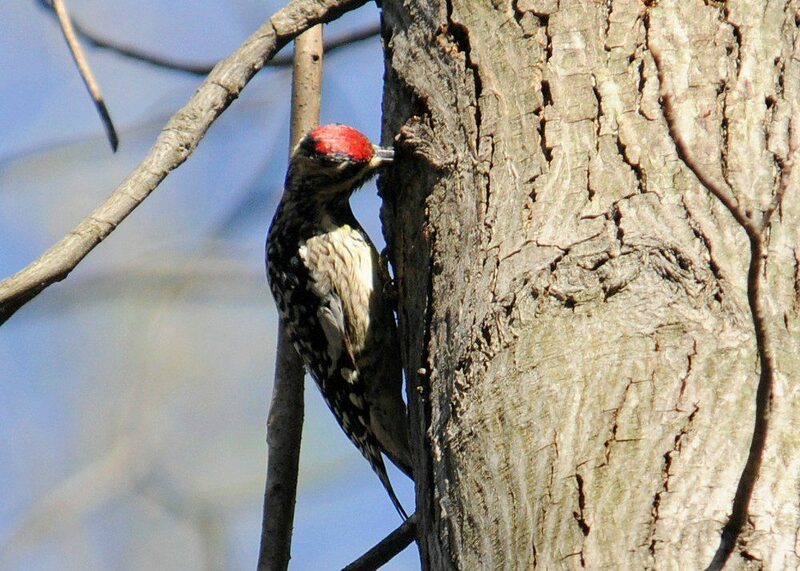 At this time of year, trees in the Oak, Cherry, and Poplar family are good bets to attract birds. A Warbling Vireo pauses in a Tulip Tree while feeding on caterpillars. Image by Derek Stoner, April 28, 2012. 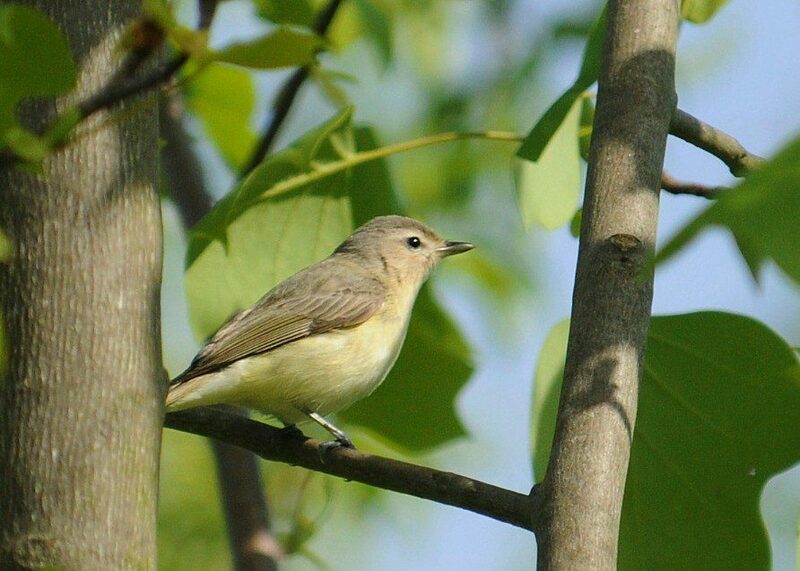 The Warbling Vireo is a species of vireo that breeds locally along streams, and is often found nesting in Sycamore trees. This bird I observed today was gleaning caterpillars from a young Tulip Tree, in the slow and steady manner that is characteristic of vireos. Perhaps it will stay to nest at Middle Run! 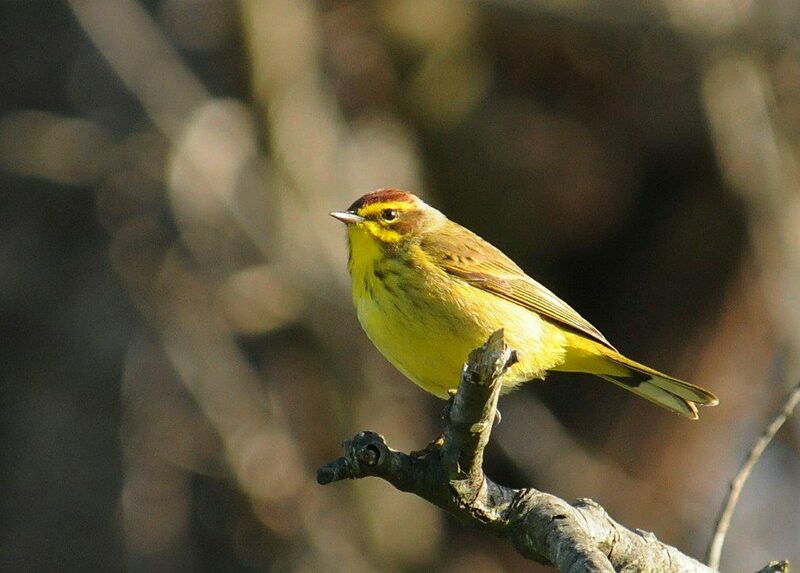 What Spring migrants and bird activity are you seeing in your area right now?